1500QE is an excellent 230V singe phase power pressure washer. It uses diesel fuel to heat up the water necessary to dissolve heat reactive substances (stains, oil, grease etc.). This hot water machine is the lightest model in its category; therefore, easy for use and transportation. More horsepower (3HP) delivers higher PSI level than the previous model; the totally enclosed motor is placed on powder-coated frame. The triplex plunger pump is equipped with ceramic plungers and stainless steel valves. 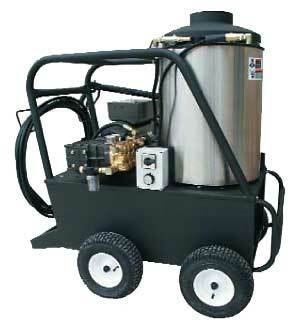 These power pressure washers also come with a dual wand with side handle and detergent tip, adjustable thermostat and pressure pop-off, 40' pressurehose, quick change tips in 0°, 15°, 25°, 40° soap tip, and powder coated frame with hose/wand rack.